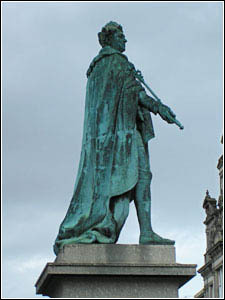 Sculpted by Sir Francis Chantry, this bronze statue of George IV was erected to commemorate the kings visit to Edinburgh in 1822. 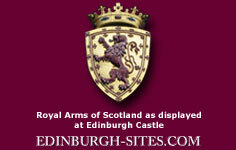 It was funded by public subscription under the chairmanship of Lord Meadowbank. It stands at the junction of George Street and Hanover Street. George IV was the first Hanoverian monarch to visit Scotland and his triumphant arrival in Edinburgh, clad in tartan and tights, was orchestrated by the great Scottish Novelist Sir Walter Scott. George IV (George Augustus Frederick) was the son of George III and Charlotte of Mecklenburg-Strelitz whom George Street and Charlotte Square are respectively named. He ascended the throne on 28th January 1820 and was crowned king of the United Kingdom of Great Britian and Ireland at Westminster Abbey on 19th July 1821. As Prince of Wales and monarch he led a flambouant lifestyle and had several mistrisses. It is reported that everytime he was intimate with a woman he kept a lock of her hair in an envelope, at the time of his death on 28th June 1830 there were 7,000 such envelopes. He was always in debt and relied on Parliament for financial help.